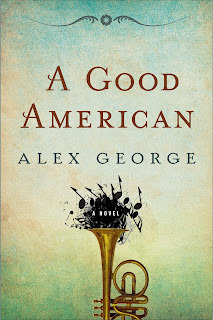 A Good American by Alex George grabbed me and held me from the first page, not because it was action packed, but because the narrator had a luring, lyrical voice that pulled me into the lives of a couple of German immigrants and their families down the line. The narrator is the third-generation member of the Meisenheimer family now rooted in America. He tells how his grandparents came to the United States and forged a new and unfamiliar life in the small town of Beatrice, Missouri. This book was rife with colorful and memorable characters from all of the Meisenheimers including Frederick, a good American, to the people who touched their lives like Lomax the cornet player, or the hell-fire, long-haired reverend, or Mrs. Fitch who taught more than music. I wanted to hear about the people of Beatrice and was almost sad when the book ended. I wanted to hear James, the narrator, eloquently weave more humorous and touching tales. True to life, there were sad incidents that got me choked up, but I also found myself laughing out loud at times. This novel is a reminder that America is a land of immigrants. Being a first-generation American, I felt a connection to this book. My parents came from Germany, too, of course, under totally different circumstances. Everyone has a history to cling onto. But like most Americans, I feel blessed to be living here. I think Alex George summarized it beautifully. We are all immigrants, a glorious confection of races and beliefs, united by the rock that we live on. As the years wash over us and new generations march into the future, family histories are submerged into this greater narrative. We become, simply Americans. Alex George, A Good American (New York: G.P. Putnam’s Sons, 2012), 371. I give this book a thumbs-up. Es ist gut! My book club had the following to say about it: They all liked it. Okay, so this time we weren’t talking all that much about the book, but we had a good reason. I just became a first-time grandma and, of course, baby talk trumps book talk. My granddaughter is just adorable! See the picture? Don’t you agree? This third-generation American looks a lot like her grandma. :) Well, I like to think so anyway. Welcome to the world little one! Each note Joseph sang was a small starburst of beauty, too beautiful for the world into which it emerged. My grandmother’s life had been one long opera. There had been drama, heroes, villains, improbable plot twists, all that. But most of all there had been love, great big waves of it crashing against the rocks of life, bearing us all back to grace. We cannot exist without our histories; they are what defines us. Sounds like a book I really would enjoy. Thank you for the review, I enjoyed it, as always. Please let me know what you think of it if you do read it. The only tiny exception I had to the book was that the author referred to German food as bland. He's never had my mother's cooking! I love German food. It's flavorful and delicious!